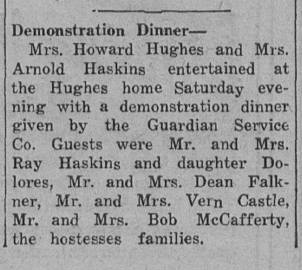 In its day, Guardian Service ware was sold door-to-door, often at neighborhood parties where a salesman would prepare a demonstration dinner. 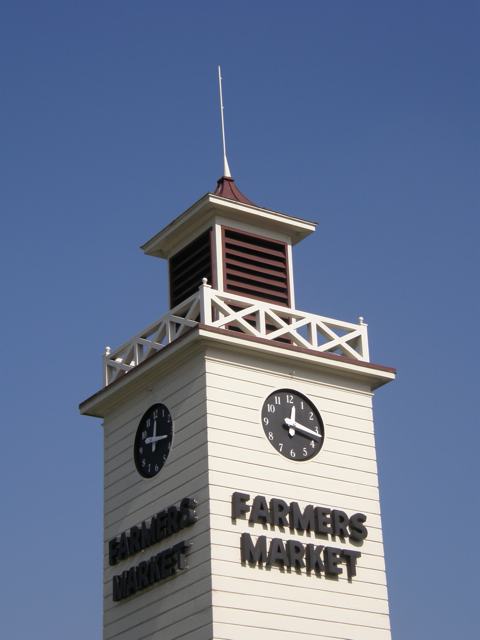 Similar to the later Tupperware parties, the sales strategy relied on showing the product to the customer first-hand. The salesmen prepared and presented meals to highlight their pitch: the economic and nutritional advantages of waterless cooking the "Guardian Service Way." The hostess would receive a caddy of highball glasses with matching coasters or candlesticks or salt and pepper set, or other such gift. 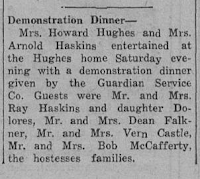 These dinners were often publicized with listings in the social register, such as the one pictured below. Last week we recreated the Guardian Service Demonstration Dinner (while trying to keep our "Knights of Nutrition" proselytizing on medium low). We packed up the Guardian Service Roaster, Duplex Pan and Economy Trio Cookers, and the Beverage Urn and Coffee Maker and prepared a dinner for eight at our friend Nancy's home in Venice. Among those in attendance were our friend Dirk (who we discovered had sold waterless cookware in his college years) and Sam Watters (author of the LA Times' Lost LA feature on our Guardian Service cookware collection). 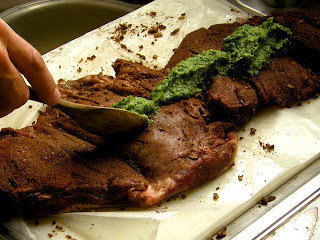 We wanted to cook an elegant dinner that would showcase the key advantages of Guardian Service Ware (the economy and nutrition of stove-top, waterless cooking) with fresh, local, seasonal fare, so we left planning the menu until we shopped our ingredients, starting with the cut of meat. The family farm on which I was raised in North Dakota maintains a small herd of free-range beef cattle which are integral to its organic, bio-dynamic, self-sustaining ecosystem. 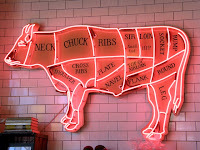 Here in Los Angeles, we're fortunate to receive most of the red meat we consume from my family's farm, so we never really consider buying beef raised in a feed-lot Cowschwitz. Regular outbreaks of food-born illness have heightened public awareness of the health and environmental risks involved in raising and eating hormonally and genetically modified animals. 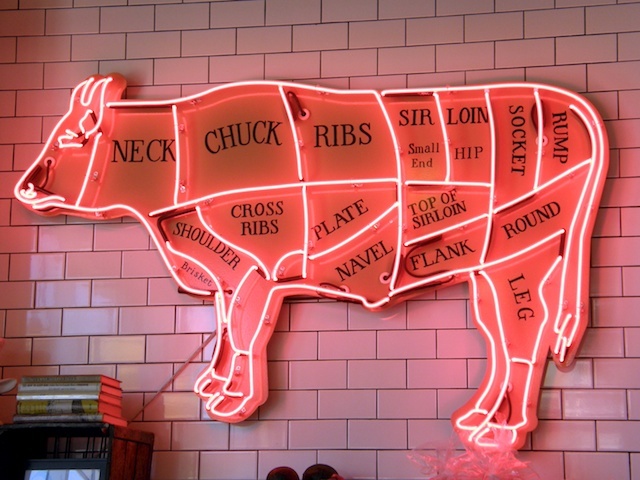 Whenever possible, we look for a butcher who sources meat from ranches employing ethical, humane practices. We've been reading and hearing about Lindy & Grundy for over a year and thought what better way to showcase the Guardian Service Roaster than with something special from this excellent charcuterie? 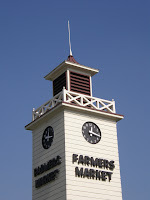 As we shopped for produce at the Farmers Market at Fairfax and 3rd, I surfed some recipe sites for inspiration. All the local organic vegetables and spices we needed were available for the seasonal Persian lamb dish below. We altered a few ingredients from the original recipe, roasting the garlic and jalapeño in advance to mellow and sweeten their effects on the meat. We prepared one pot each of carrot coins, red and white new potatoes and red and white cabbage in the Guardian Service Economy Trio Cookers (or "triangle pans" as they're often called). And for dessert: a lemon pound cake cooked stove-top in the Duplex Utility Pan, topped with fresh strawberries muddled with brown sugar and plain yogurt and served with Guardian Service Coffee. 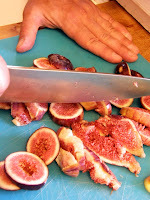 *Verjus, a sour grape juice, is traditional for a Muslim recipe. Vinegar and wine are a fine substitute. Lightly coat 2 dozen peeled garlic cloves in a small or medium sized pot. Cover and place over medium high heat for 5 minutes, until lid is warm to touch, reduce heat to low and roast for 30 minutes, shaking pot occasionally to keep cloves from sticking. Add minced jalapeños and continue to roast additional 5-10 minutes. 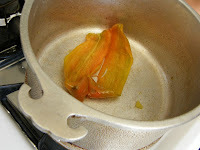 Remove pot from heat and allow to cool. 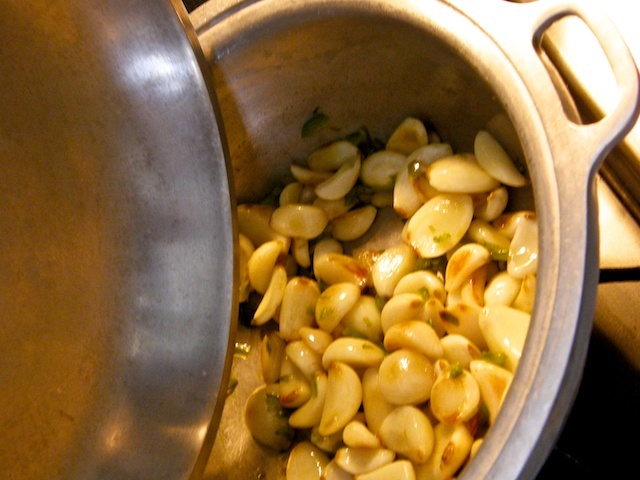 Using a food processor or blender, blend the roast garlic and jalapeño together with chopped mint and parsley and set aside. 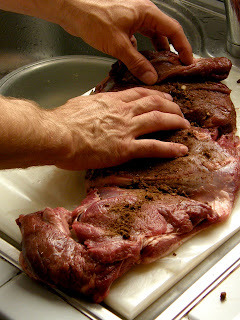 Rub the dry spices and ginger into the prepared cut of meat, massaging well. 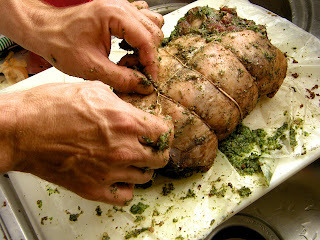 Spoon a ribbon of the garlic paste into the center of the cut and roll into a roast, securing with kitchen twine. Heat 1-2 Tbsp of olive oil in the Guardian Service Roaster over medium heat and coat bottom of pan well. Add the roast, searing each side for 90 seconds. 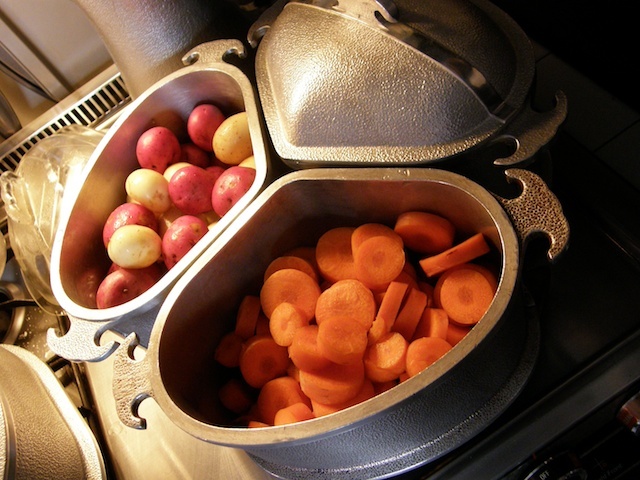 Remove roast, add the halved carrots and quartered onion to the bottom of the roaster to form a cooking rack to support the roast. 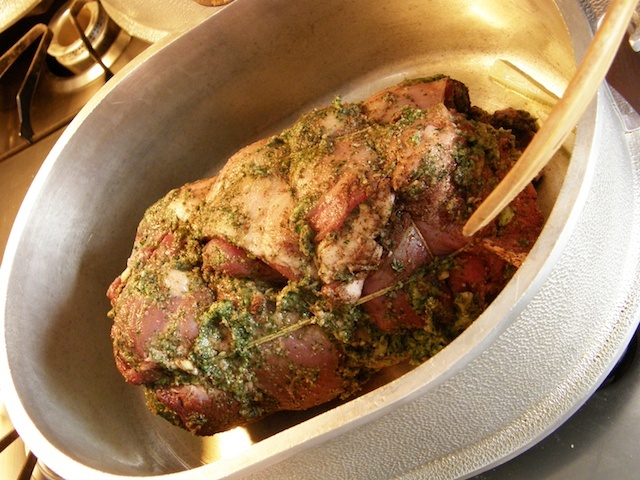 Return roast to pan, add any remaining garlic paste to the top, and sprinkle generously with cider and wine. 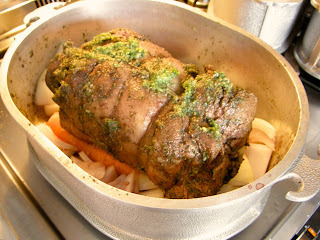 Cover and cook over medium low heat for 1.5 to 2 hours, depending on desired temperature of the finished roast. Allow to rest for 15 minutes, carve and transfer to the Guardian Service Roaster platter. Garnish with roasted carrot and onion and cover until ready to serve. 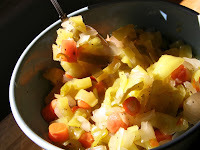 Reduce the remaining roast and vegetable drippings over medium low heat, adding a tablespoon of cornstarch or flour mixed an equal amount of water or wine to the gravy to thicken, if desired. 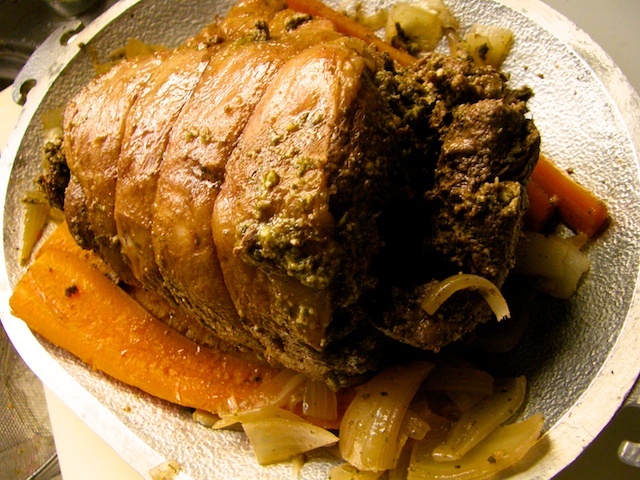 Serve with roast and vegetables. For advice on preparing the carrots, potatoes and cabbage, visit our previous blog post on cooking vegetables the "Guardian Service Way." Adapted for the Guardian Service Duplex Utility Pan. Serve warm or cold. Make ahead, freezes well. Blend butter until creamy, add sugar, then eggs and lemon juice and zest. Sift together remaining dry ingredients and fold together with remaining wet ingredients. Spoon into heated, buttered Duplex Utility pan, close and cook for 13-15 minutes on medium low heat. Flip pan and cook additional 13-15 minutes. 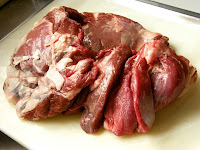 Remove from heat and allow to rest unopened an additional 10-15 minutes. Open pan and gently run a knife along the edge of the cake to loosen, remove to baking rack and cool. Slice and serve with fresh strawberries and yogurt. 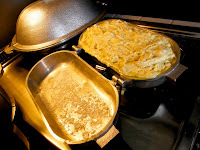 Don't miss our other blog posts with recipe ideas for the Guardian Service Duplex Utility Pan and instructions for making Guardian Service Coffee. Here are a pair of sauces—cooked up Guardian Service style—that celebrate two end-of-summer flavors: peppers and figs; perfect with any grilled meal or outdoor lunch. Serve them fresh or water bath can them to savor later. 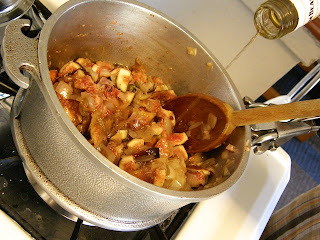 The "waterless cooking" method is especially suited to sauces like these because it intensifies and marries the flavors. 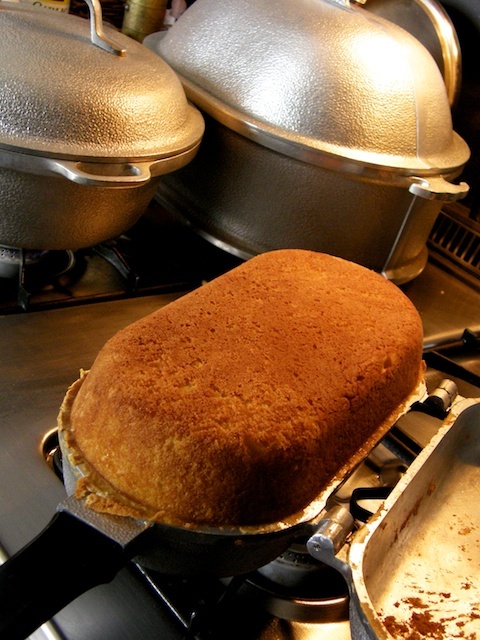 These can be made ahead in any medium-sized Guardian Service unit (a "triangle"pot, fryer, dome cooker, etc). 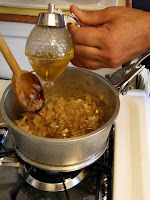 Each sauce requires adding ingredients at earlier or later stages, so that all reach the desired texture and don't over or under-cook. Prepare hot peppers: wash, seed and remove stems from peppers (you may want to use latex gloves for this). Coat with olive oil, add to GS unit and roast on medium for 20-30 minutes, shaking unit occasionally to keep peppers from sticking. Set lid slightly ajar for last 10 minutes to allow moisture to escape. Remove peppers and allow to cool. Dice carrots into bite-size pieces and add to Guardian service unit. Begin roasting carrots over medium heat. Meanwhile, prepare sweet peppers: wash, seed and remove stems. Dice sweet and hot peppers and sweet onion together. Add to the roasting carrots, reduce heat and allow all vegetables to cook together for 10-15 minutes, just long enough for the carrots, onions and sweet peppers to retain a slight crunch. Remove from heat and add remaining ingredients and stir until well-coated; allow to cool. Chill and serve. Chop onion and sauté in butter (or oil) in Guardian Service unit until translucent. Add balsamic vinegar, garlic powder, agave and/or honey and continue to cook. 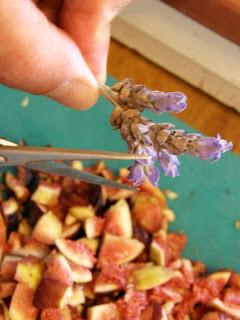 Chop figs and lavender flowers and add to onion. 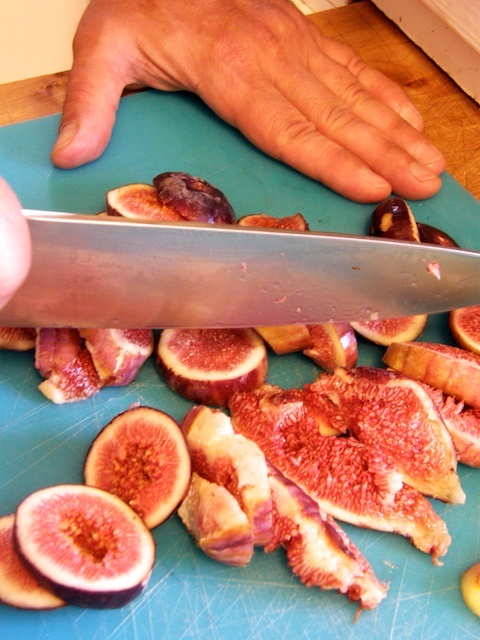 Add remaining seasoning (clove, salt, pepper and bourbon) and cook for twenty minutes or until the figs cook down into a sauce.